No style points -- Banged up and coming off a Friday loss in New Jersey, the Montreal Canadiens couldn't have cared less how they looked on the ice Sunday as long as they left Bell Centre with two points. Andrei Markov ensured that would happen, as he scored in the third round of a shootout to cap a 6-5 win against the Florida Panthers in a game that was entertaining, if not a masterpiece. "I don't think anyone would disagree with you if you said it was an ugly win," said defenseman Mike Komisarek, who was picked as an Eastern Conference starter for the All-Star Game along with Markov, goalie Carey Price and right wing Alex Kovalev in fan voting announced Saturday. Price is currently out of the lineup, along with captain Saku Koivu and scoring wingers Alex Tanguay and Christopher Higgins, among others. Montreal coach Guy Carbonneau turned once again to Jaroslav Halak in net against Florida, and although he didn't stand on his head, Halak came through with three stops in the shootout. "At this time, we need him to be sharp," Carbonneau said. "We were able to get two points for him, which I think earlier in the season, when he was playing well, we were not able to get, but in the situation that he's in right now he needs to be a little sharper." Playing for pride -- They finished last not only in the Southeast Division but the entire NHL a season ago, and the Tampa Bay Lightning have no desire to dwell in the cellar once again. They took a step in their climb toward respectability Sunday by dominating the Atlanta Thrashers 4-1 at Philips Arena and jumping a point ahead of Atlanta into fourth place in the Southeast. Martin St. Louis notched a pair of goals while Mike Smith came within 22.1 seconds of a shutout, finishing with 27 saves. "Obviously, the last time we were here, we were very disappointed with our performance and the result," St. Louis said, pointing to a 5-4 loss to Atlanta on Dec. 20. "Since then we have been playing much better hockey." The Lightning had a modest three-game winning streak recently before struggling again prior to Sunday. Meanwhile, the Thrashers failed to build on a shootout win against Vancouver in their previous game. Frustration appears to be growing, and it was revealed in the post-game comments by first-year coach John Anderson. "I've got to question whether anybody cares in that locker room right now," Anderson said. "It's a joke." Paying dividends -- When they added Brian Rolston during the offseason, the New Jersey Devils undoubtedly envisioned power-play goals filling the nets as a result of Rolston's cannon shot. However, an early season ankle injury knocked the forward out of the lineup for 18 games and kept him from unleashing his patented drives from the point. Healthy again, Rolston gave the fans at Prudential Center what they were hoping to see when he scored a power-play goal 1:43 into overtime Sunday for a 4-3 win against the road-weary Ottawa Senators. "It's been a bit of a struggle coming back from my ankle," Rolston said. "It was just a 4-on-3 situation and I just pulled it to the middle. Gio (Brian Gionta) had a good screen in front and I got off a good shot. There wasn't much complicated about it." Winning on the road has been a complicated formula for the Senators, who are 1-4-1 with two games left on their current trip. They found their scoring touch against New Jersey, taking three separate one-goal leads, but couldn't make any of them stand up. "It's the story of the Devils," goalie Alex Auld said. "Any time you make a little mistake or take an untimely penalty they jump on it. That's what they are all about. This one is obviously tough. We had the lead three times and they kept battling back." Moving right along -- In the weeks leading up to the 2009 Bridgestone NHL Winter Classic, the Chicago Blackhawks shook off all talk of distractions and won a franchise-record nine straight games. Now that the Classic is over, the team is focusing on securing a playoff berth and jockeying for position in the Western Conference. The Blackhawks shook off a pair of losses last week to Detroit, including a 6-4 setback in the Winter Classic at Wrigley Field, and got back to business with a 5-2 win against the Calgary Flames on Sunday. "It was a great opportunity for everybody to be part of (the Winter Classic)," Chicago coach Joel Quenneville said. "We move forward. I like the way we handled tonight. We played a team that's playing very well and it was a very important win for us." Back indoors, the Blackhawks improved their record at the United Center to 12-1-4 and recorded another sellout with 22,146 on hand. 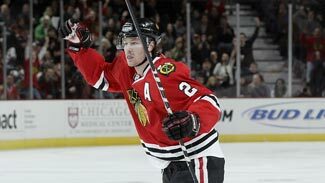 "This was an important game, back in our building," defenseman Duncan Keith said. "We wanted to get a good feeling back in our room. It felt like coming back home after a while. Part of the reason for our success at home is because we have a full building." Specialty-team success -- The way coach Randy Carlyle saw it, the Anaheim Ducks did it all right Sunday in defeating the Phoenix Coyotes 2-0. They connected twice on the power play, taking advantage of a pair of too-many-men penalties, while surviving four shorthanded situations, including a 5-on-3 disadvantage. "Tonight was our best team effort that we've had," the Anaheim coach said. "I think the difference in the game was our special teams. We got two power-play goals and they went (0-for-4) on their power play, so our penalty killers and our power play stood up." Ducks goaltender Jonas Hiller made 29 saves while Chris Pronger and Bobby Ryan supplied him with all the offense he would need by scoring goals. Down at the opposite end from Hiller, former Anaheim netminder Ilya Bryzgalov played solidly for the Coyotes. He expressed disappointment at the carelessness that led to the penalties and ultimately resulted in the Ducks' goals. "We are not playing for the first time. This is not our first game," Bryzgalov said. "It's one thing when you save a breakaway and you get the penalty. It's another when you get it for nothing." Delayed revenge -- Owen Nolan was drafted by the Quebec Nordiques and even played briefly for their successor, the Colorado Avalanche, before he was traded away in 1995-96. More than a decade later, Nolan found himself personally responsible for beating his old team Sunday, as the Minnesota Wild veteran scored twice in a 2-0 win at Pepsi Center. "Played too many games to worry about that now," the 17-year veteran said of any satisfaction he might have gained. Niklas Backstrom was brilliant, making 33 saves to give the Wild their first shutout of the Avalanche in 61 games including the regular season and playoffs. Nolan didn't seem fazed by the statistic. "They've got a lot of talented guys over there. They can score goals," he said. Nolan now has nine goals this season and he easily could have had a hat trick if the net had been just a little bit wider. "I had about 50 tonight (off the post)," Nolan said. "I seem to be in the right place at the right time right now." Getting there the hard way -- Playing on consecutive nights is difficult enough. When there's travel involved, it gets even tougher. And forget about what the Dallas Stars had to go through -- their flight out of Edmonton on Saturday was canceled due to weather conditions and they didn't get to Vancouver until late Sunday morning. But the plucky Stars shook all that off, as well as a 4-1 loss to the Oilers, and responded with a come-from-behind 3-2 shootout win against the Canucks at GM Place. Mike Modano and Mike Ribeiro rallied them from a 2-0 deficit in regulation and the Stars prevailed in the fifth round of the penalty-shot tiebreaker on a James Neal goal. ''Last night we didn't show up, so we had a lot of energy left tonight,'' Ribeiro explained. It was a frustrating finish for the Canucks, who also lost a shootout Friday in Atlanta are now 1-5 in them this season. Jason LaBarbera, acquired last week from Los Angeles, is 1-0-2 with his new team. He made 34 saves against the Stars but was victimized on three of their five shootout attempts.